When I got this book in the mail, the sweet dog on the over sitting with a little boy totally did me in. We all know how I feel about covers with animals on them…I’m a complete and utter sucker! What a way to lure readers….so cute and charming was this cover. Plus I love the blue and gold accents. Basically this was an easy yes for a review based on the cover. But the question for me was when can I work it in to my schedule? I was already pretty tight for early fall reviews so I had planned on Oct for this one. But the cover just kept coming to mind on a regular basis so I decided to make room and read this book so I could stop seeing a cute golden dog with his little boy in my mind every time I opened a new book! 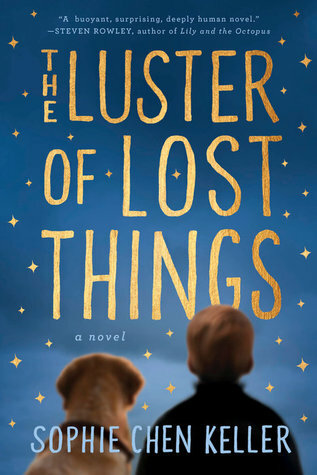 Steeped in nostalgic wonder, The Luster of Lost Things explores the depths of our capacity for kindness and our ability to heal. A lyrical meditation on why we become lost and how we are found, from the bright, broken heart of a boy who knows where to look for everyone but himself (summary from Goodreads). This book is marketed to fans of The Curious Incident of the Dog in the Night-Time, a novel which is still hands down one of my favorite books. It’s such a memorable and unique story that stuck with me years and years after reading it and still resonates with me even now. So needless to say that marketing tagline hooked me. Yet this book based on the description sounded nothing like The Curious Incident. I mean, The Curious Incident never had any magic or magical realism but I was still on board. People make room in your reading schedule for this book. Move it up on your TBR list. Put down the book you are reading now. Whatever you need to do to read this book, do it now! Even if you aren’t a magical realism fan, this book has so much to recommend itself beyond the magical elements. I think what I personally loved the most was seeing the world through Walter’s eyes. Writing an adult novel from the perspective of a child is challenging and then you add in a child with special needs and it becomes almost unheard of. The only time I thought it was well done was with The Curious Incident and then this one came along. Walter is an extremely likable, endearing character that I fell in love with instantly. His dog Milton….and overweight golden retriever?! Sold. Enough said. I adore this dog. Together Walter and Milton create a memorable story. The story itself has an air of whimsey to it but still manages to be appealing to more serious minded readers. I was only a couple of chapters in and I abandoned my other book to read this one and next thing I knew I was almost done and sad that it was coming to a close so rapidly. When it ended I was left with a warm cozy feeling and I felt good about how the characters and story lines were resolved. But this novel was so much more to me than just another magical realism novel or even a contemporary novel. It was a very human story. Even with the magical or whimsical elements woven in, it didn’t take on an unrealistic feel. The characters were powerful and the character arch (especially for Walter) was fascinating and moving. Everything was satisfying but for me it was the journey that made this book memorable and pushed me to keep reading .